Feel free to post it. The next G3 is Thursday - Sunday, March 16-19, 2006, Mobile, AL. The talks will take place at the University of South Alabama (USA!). Here is a map showing the Mathematics Department and the hotel map where you can also see the location of the university. The talks will begin in the morning on Thursday and end by noon on Sunday. As usual, we will start with a few educational talks. Those are oriented toward students, non-experts, general audience. Conference organizers: Stephen Brick, Craig Jensen, Igor Mineyev. A very incomplete list of who is coming: Josh Barnard, Angela Barnhill, Igor Belegradek, Stephen Brick, Nathanial Brown, Jon Corson, Michel Coornaert, Dan Farley, Koji Fujiwara, Henry Glover, Ursula Hamenstaedt, Craig Jensen, Fabrice Krieger, Jean-Francois Lafont, Yvonne Lai, Enrico Le Donne, Christopher Leininger, Feng Luo, Dmitry Matsnev, Igor Mineyev, Volodymyr Nekrashevych, Damian Osajda, Denis Osin, Dongwen Qi, Lucas Sabalka, Roman Sauer, Benjamin Schmidt, Zoran Sunik, Jeremy Tyson. Maybe: Patric Bahls, Peter Brinkmann, Igor Nikolaev (Calgary), Frank Quinn. We are looking for people with digital cameras to take pictures during the conference. We would also like to take a picture of "the G3 team", so if you have a G3 sweatshirt, don't hesitate to bring it. A block of rooms is reserved at Homewood Suites Hotel. They have spacious suites (not just rooms). The suites are either king-size or double. King-size has one king-size bed and a sleeper, so potentially 2 people can share it. Double has two beds and a sleeper, so potentially up to 3 people can share it. (The double suites have two separate bedrooms with private baths.) Here are the participants looking for someone to share a suite with. There is one double suite available right now, so join it before it is too late (you do not pay for the room if you join). The group (!) rate is $89 + 14% tax per suite per night. This should apply to Tuesday-Monday, March 14-20. Rates for other dates are higher. Please also note that articipants can receive this rate only if they call (251)634-8664 as soon as possible to reserve a suite, but certainly before February 28, 2006. Ask to talk to the manager Sharon Priester, she is handling reservations for this conference. Please mention the group name: USA Geometric conference, this is what they call it at the hotel. You will be asked to provide a credit card number. If you make reservations after February 28, the price will be much higher, and suites might be not available. Breakfast (Monday-Friday 6.30-9.30am, Saturday-Sunday 7.00-10.00am) and dinner (Monday-Thursday 5.30-7.30pm) are included in the price. The hotel has a minivan that can bring people from the hotel to the university, and back. It can only take a few people at once, so you might want to rent a car during your stay; and if you do, please feel free to give others a ride. Our thanks to Atlas Conferences Inc. for providing the abstract services for the conference. The abstracts and the schedule are now available. 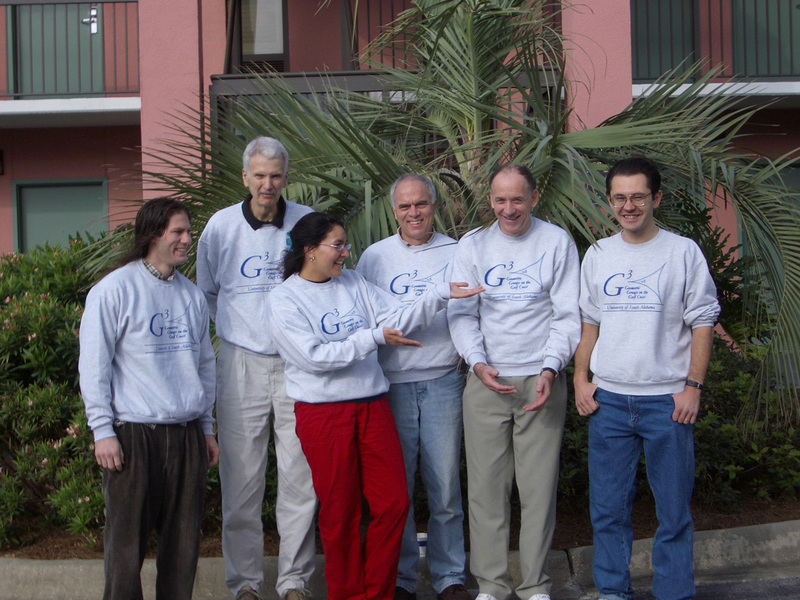 Many thanks to those who came to the G3 conference in November 2004, despite the fact that we had to move it to Destin, Florida, after hurricane Ivan damaged the hotel in Pensacola Beach. See pictures of those brave men and women. Note a slight change of time and place of this conference as well. This G3 was planned for New Orleans, LA, but this time hurricane Katrina has not let us do that. The hurricane season begins in June and ends in November. Peak storm activity typically occurs from the end of August through mid-September. We are not planning any hurricanes during the conference. Please rest assured that the next G3 will take place. Plan on coming. Following our tradition, we will try to support accommodations for students coming for the conference. Preference will be given to those who share a suite in Homewood Suites Hotel, see the information above. Please make arrangments in advance. A special place in the conference room will be designated for participants' articles and preprints ("poster session"). Everyone is very much encouraged to bring (multiple copies of) their articles/preprints to discuss and to share with others. There will be a specific period of time set during the conference for participants to discuss their displayed articles with others. This is to give everyone an opportunity to present their work. Make sure to get involved. G3 sweatshirts are real cool. To have an idea what it looks like, see, for example this picture, this picture, or that picture. Let us know if you would like to have one for $13 at the conference so that we have enough supply. November 2002 in Pensacola Beach, Forida with abstracts and pictures.